Unlock Wifi, discover Passwords, Pins, Codes, Pass, Wap, Wap2 and etc. The instructions are already on the software. While you are going through it, the software will give you tips, description and errors, so there will be no complicated neither misunderstanding steps. As you can see, this goes by order. You can not click set setting and also Generation without filling out the information needed on the top, like "Select Dictionary. area code, etc." - The first step is selecting the dictionary. Click on the one you would like to use. It can have numbers or letters in any way. 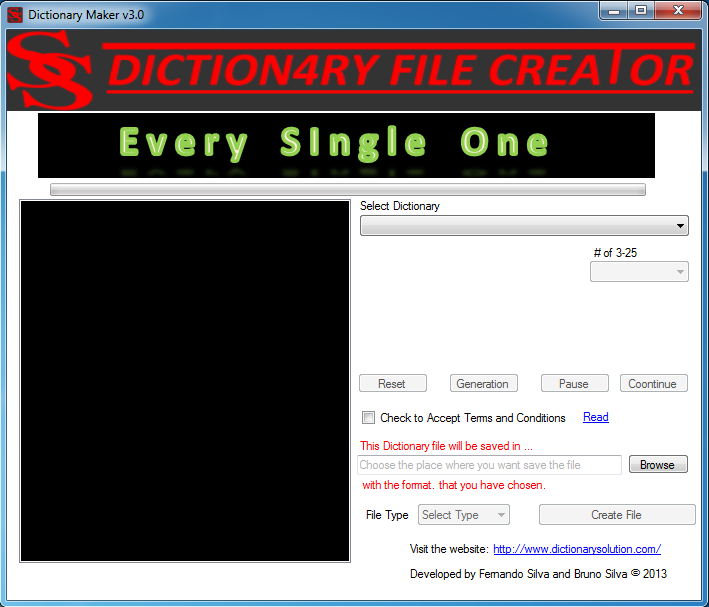 On the first version of Dictionary creator, there wasn't access to insert o51, 052, 053 and so on but now the program is updated and you are now able to do that. 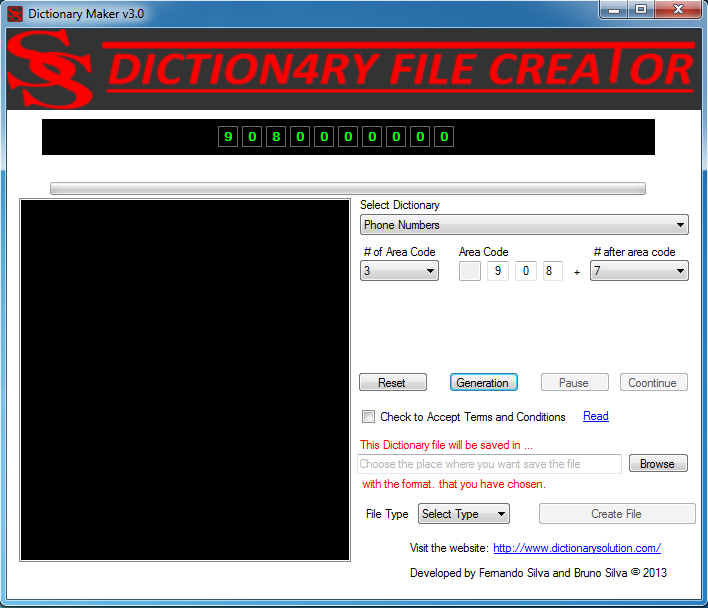 - If you desire TXT, (text) your dictionary WILL be saved in that format as Dictionary.TXT. - Now if you also desire BAT, it WILL be saved in that format. - While you are on that process you can see that there is a button where it says "browse" . The place you picked is where the file will appear. - If you made a mistake or would like to start all over, there is a button that says "reset" and you can start from the first step again. As you should know, this is a free site and can be used how you prefer. This program took a lot of dedication and hours to finally be made. There is a yellow button that says DONATE all the way at the bottom. With a donation we will accept that as an appreciation, certainty that we helped you and that will motivate us to do better and keep upgrading the program to help people like you.